An Orgone Pyramid channeling the radiant light of the Goddess! A Madagascar healing quartz crystal point floats at the tip within a sea of rose quartz, larimar, ajoite, pink tourmaline and chrysocolla. Dense layers of copper and brass hold crystal healing stones of green aventurine, magnetite and moonstone. I added dried roses and flowers from my garden to sweeten the energy and deepen the connection to the Goddess. .
As the orgone pyramid purifies your EMF space is created for these natural healing crystals to work their magic. The vision I held while pouring this pyramid was to strengthen the energy channels from the Heart Chakra to the Third Eye. Encouraging you to access Divine wisdom and the truth of the Heart and then use your voice to communicate with power, grace and beauty. Hold this Violet Flame Orgone Pyramid in the palm of your hand during meditation to attune to the frequency of the Goddess. Keep by or under your bed for deep healing in your sleep, in your work area to support you in speaking your Truth, or place in a thoughtful area of your home as a reminder of your power. 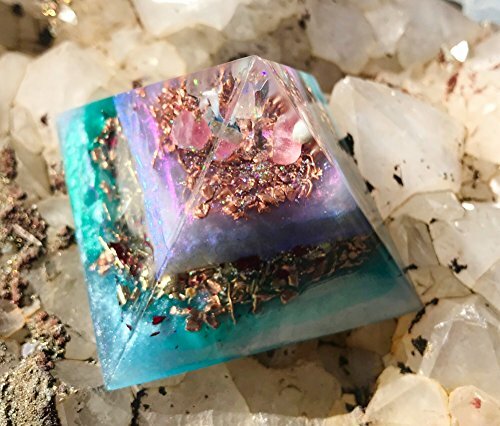 Use this Orgone pyramid to create space for growth in love, work, and the Soul's evolution. Backside of Water - Disneyland Jungle Cruise Inspired Metal Sign.